The multifunctional stick light which can bring a natural fill effect,no need PS or other beauty software,ideal for dark night clubs,parties,camping,etc. 【Built-in Rechargeable Battery】The Fill light includes a built in rechargeable battery,you needn't spend more money to buy the batteries,it's more environmental and saving money.Including the USB charging cable that you can charging it anywhere. 【Hight Quality and Light Weight】Made of the hight quality plastic,more resistant to fall and the weight is more light.You can take the Selfie LED Light anywhere you go,just put on your bags or even in your pockets.It just like having a personal studio photographer that can attach to your mobile devices whenever and record all happy moments in your life! 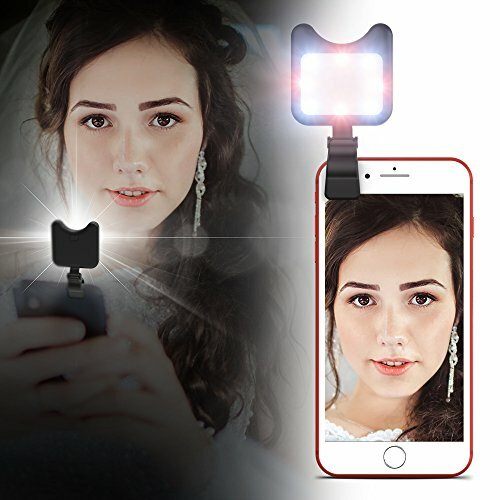 【With 9 Lighting Modes and Natural Fill Light Effects】9 light setting for various use--make-up, selfie photos, dark scenery vlogging et.No high-luminance spot,getting a natural fill lighting effect,no need PS or other beauty software,ldeal for dark night clubs,parties,camping,etc,with this selfie light we will never have to worry the dark environment again. 【100% Money Back Guarantee】We believe that you deserve the best purchase experience!We developed this fantastic Selfie Light to make you can take the best photos.If you're not happy with it for whatever reason,we guarantee a new replacement plus no-hassle money back.ADD TO CART NOW! !